Indian Space Research Organisation (ISRO) will explore for the first time the possibility of runway landing of rockets just as airplanes do at airports and by mid of this year, ISRO plans to Reusable Launch Vehicle – Technology Demonstrator (RLV-TD) will be taken to an altitude of 3 km using a Mi-26 helicopter and dropped from an angle which will allow it to glide back and make a safe landing . 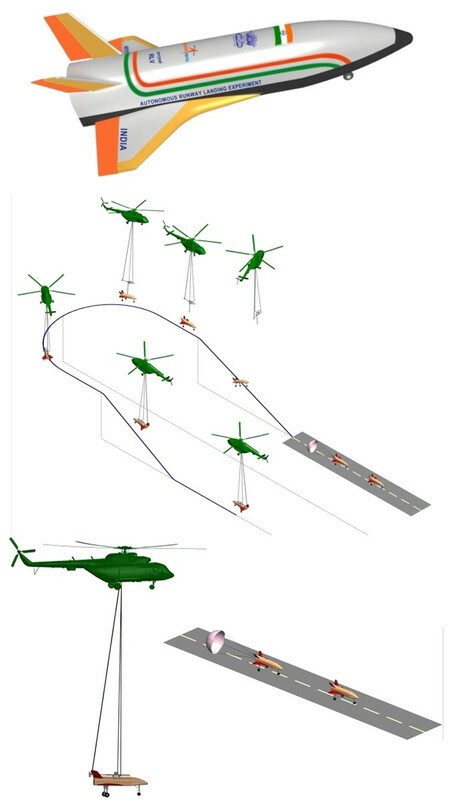 RLV-TD is unmanned but is equipped with basic onboard systems that will ensure aircraft lands back on a runway as showcased in the above picture. In 2016, ISRO successfully test flew a winged experimental reusable launch vehicle (RLV) that splashed down in the sea after reaching an altitude of 65 km. Reusable launch vehicles are expected to slash the cost of space launches to almost one-tenth. According to ISRO, Reusable Launch Vehicle-Technology Demonstration Program or RLV-TD is a series of technology demonstration missions that have been considered as a first step towards realizing a Two Stage To Orbit (TSTO) fully reusable vehicle. A Winged Reusable Launch Vehicle technology Demonstrator (RLV-TD) has been configured to act as a flying test bed to evaluate various technologies, namely, hypersonic flight, autonomous landing, powered cruise flight and hypersonic flight using air-breathing propulsion.